For Will Boast, what looked like the end turned out to be a new beginning. After losing his mother and only brother, twenty-four-year-old Boast finds himself absolutely alone when his father dies of alcoholism. Numbly settling the matters of his father's estate, Boast stumbles upon documents revealing a closely guarded secret his father had meant to keep: he'd had another family entirely, a wife and two sons. Setting out to find his half-brothers, Boast struggles to reconcile their family history with his own and to begin a chapter of his life he never imagined. 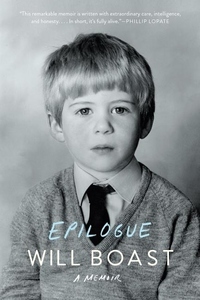 "Riveting, soulful, and courageously told" (Maggie Shipstead), Epilogue is the stunning account of a young man's journey through grief in search of a new, unexpected love.